Consider an ideal type: the (pure) adversary intends that his or her position should prevail. To be an adversary is, by presumption, to be engaged in a contest, that is, in a collective endeavor in which it makes sense to occupy a position. In philosophical discussion (as always, I presuppose good faith) it is understood that assertions must either be defended if questioned or explicitly taken as assumed (locally if not globally) for the sake of argument. A philosopher writing in an aphoristic mode may proceed as if that requirement had been suspended: but it is only suspended, not removed. To remove it would be to shift the aims of philosophy, e.g. toward spiritual exercise (historically, a character of philosophy no less prominent than truth-seeking: see Pierre Hadot’s Exercices spirituels et philosophie antique, Matt Jones on Descartes, Pierre Force on Montaigne and Pascal, and John Sellars on Justus Lipsius). Philosophical discourse is in that respect always disputational. At minimum to offer reasons for p is also to offer reasons against not-p, and thus to implicate a sort of contest between the proposition asserted and its negation. (On the agonistic origins of Western philosophy see G. E. R. Lloyd’s Revolutions of wisdom and Demystifying mentalities and Marcel Detienne’s Maîtres de vérité; on scholastic disputation, see John Marenbon’s Later medieval philosophy, and on disputation as ritual spectacle see Enders 1993 in the bibliography below; Catarina Dutilh Novaes has written here on argument as dialogue). Kukla is right in exhibiting contempt for anyone who is put off by mere disagreement among philosophers (see also her further remarks at Facebook). But I see no reason to suppose that philosophy must be aggressively disputational. Must an objection be cast as an attack? Disputation needn’t be agonistic, in my view; on the contrary, if the collective aim is to conduct an inquiry into truth, cooperation may be just as productive. Placing a “high premium on verbal sparring and cleverness” (where cleverness denotes something other than or in addition to skill in argument) is at best an imperfect means to that aim; and it exacts a significant social cost insofar as it amplifies disparities of power which have nothing to do with the capacities needed to conduct inquiry. Kukla holds that, as far as she can tell, the intense aggressive style puts off people of all sorts equally, and so no social harm will result from its being a common or the prevalent style in philosophy. That, of course, is an empirical claim. Evaluating it would require an intimacy with the literature on small-group dynamics and on negotiation (since I think it reasonable to regard the activity of a seminar, e.g., as consisting partly in negotiations about group beliefs) that I lack. Perhaps others more qualified can comment on that point. I will conclude with some impressions. In a quick review of studies of negotiation, the firmest general conclusion I can draw is that small differences in setting and expectation can generate significant differences in the importance of gender to influencing behavior. There is no easy answer to the question raised above. For example, if an activity is framed as a winner-take-all competition, women, even those who do well, are less likely to choose to take part than men (Bertrand 2010:1555), which suggests that we not frame discussion in such a way that only one person can be right. Or again: “women’s performance in negotiation improves significantly when negotiating for someone else as opposed to for themselves” (Bertrand 2010:1557), which suggests that we frame the task of discussion not as that of defending my opinion as against yours, but rather as that of determining which of the alternatives we should maintain. It would seem that the trend of the later literature points to two major conclusions: (i) the differences are usually not large, and are exhibited only when conditioned on other features of the situation; (ii) other relations, notably power relations, with which gender relations are correlated may have a greater role in social interaction. In short: under favorable circumstances, prevalence of the intense aggressive style need not, perhaps, aggravate inequality, in particular gender inequality. But it is up to us to ensure that circumstances are favorable. Marianne Bertrand. “New perspectives on gender”. In: Handbook of labor economics 4b: 1545–1592. Linda L. Carli. “Gender, language, and influence”. Journal of personality and social psychology 59.5 (1990) 941–951. Jody Enders. “The theater of scholastic erudition”. Comparative Drama 27.3 (1993) 341–363. Annette Hannah, Tamar Murachver. “Gender and conversational style as predictors of conversational behavior.” Journal of language and social psychology 18.2 (1999) 153–174. Michael A. Gilbert. “Feminism, argumentation and coalescence.” Informal logic 16.2 (1994) 95–133 (with bibliography of earlier literature). Deborah M. Kolb. “Too bad for the women or does it have to be? Gender and negotiation research over the past twenty-five years”. Negotiation journal Oct 2009:515–531. Laura J. Kray, Leigh Thompson, Adam Galinsky. “Battle of the sexes: gender stereotype confirmation and reactance in negotiations.” Journal of personality and social psychology 80.6 (2001) 942–958. Alex J. Novikoff. “Toward a cultural history of scholastic disputation”. The American historical review 117.2 (2012) 331–364. Amy E. Walters, Alice F. Stuhlmacher, and Lia L. Meyer. “Gender and negotiator competitiveness: a meta-analysis”. Organizational behavior and human decision processes 76.1 (1998) 1–29. Janice D. Yoder, Arnold S. Kahn. “Toward a feminist understanding of women and power”. Psychology of women quarterly 16 (1992) 381–388. It may well be that the conception of well-marked generations got its impetus from the world wars, now usually called One and Two. The first, once simply The Great War, was the war of my grandparents; the second, that of my parents. That distinction was clear, easy to remember, soundly based in events. 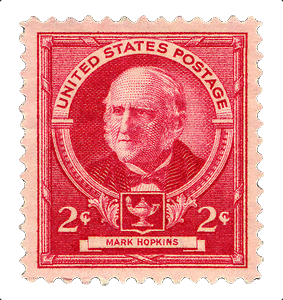 US Stamp: Mark Hopkins, 1940. There is or was in economics a so-called law known as Gresham’s: bad money drives out good. Another law, of broader application, would have it that good enough dominates best. The web, and indeed Wikipedia—to which I just happily referred—, illustrates this point. Copying is easy, compiling is easy, finding new information is not so easy, even if that means simply reading journal articles and adding a bit to the existing common store. I have Fuch’s dystrophy, a hereditary disease of the cornea. Naturally I’d like to know all I can about it. I search online, diligently, repeatedly. What I find is the same information (some of it perhaps incorrect) repeated over and over again, often verbatim, from Wikipedia to the Mayo Clinic to NIH. As soon as one tries to investigate specific questions, e.g. about the risk of surgery, one discovers that the web has no answers. I would say that it is broad but shallow; yet even that conveys the wrong impression, since the “breadth” consists largely in repetition of a small core of fact and not obviously untrue speculation. The information one gleans, with grains of salt for more dubious sources, is for many purposes good enough. Were you a journalist or a student needing two sentences on Fuch’s, you’d have them, quickly and without effort. But it is not much better than good enough. I think that that is a general tendency: the apparent wealth of the (publicly accessible) web belies a widespread poverty. Good enough drives out best—and even better. Apply this now to university teaching. Jonathan Mirsky writes in the current New York Review concerning the actions of the organizers of the London Book Fair (16–18 April) in cooperating with the Chinese General Administration to exclude dissident writers, both those still in China and those who have been exiled, from their official presence at the Fair (“Bringing censors to the Book Fair”, NYRB 59.9, 24 May 2012).He is drawing on the work of Nick Cohen at the Observer and also perhaps of Richard Lea at the Guardian. The authors taking part in the British Council Cultural programme are internationally recognised as the leading voices writing from China today. Mo Yan, the veteran writer, Han Dong and Li Er, both of whom missed ten years’ schooling during the Cultural Revolution, Annie Baobei who became an internet sensation at the age of 24, Sheng Keyi (published by Penguin China) who writes about new migrations and the metropolis – these authors are writing their best work in contemporary China. There was no disagreement with the Chinese government about the final list of British Council writers who regularly appear on well-respected lists of the best novelists and poets in China. These writers live in China and write their books there; other writers have left. The British Council respects both groups and there will be plenty of opportunities for both sets of writers to put their views across in the UK. Some of the largest structures built by humans are invisible or go largely unnoticed. The shorelines around big cities like New York have been almost completely subordinated to the needs and wants of their inhabitants. Dredging plays a large role in the building of artificial boundaries between land and sea. BLDGBLOG, a must-read for anyone interested in architecture, reports on an exhibit by the Dredge Research Collective. The Dredge Cycle is landscape architecture at a monumental scale, carving the coastlines and waterways of continents according to a mixture of industrial need and unintended consequences. Thus far, dredge has remained the domain of logistics, industry, and engineering, a soft successor to the elevated freeway interchanges and massive dams that captured the infrastructural imagination of the previous century. For the past year, the Dredge Research Collective have been exploring the choreography of these interconnected sedimentary landscapes, visiting dredged material confinement areas, from Poplar Island in the Chesapeake Bay to Hayden Island in the Columbia River, talking with dredge experts, such as the transnational materials conglomerate TenCate, the Army Corps of Engineers, and the Bureau of Land Management, and publishing and lecturing widely on dredge. […] dredging is better understood as a component of a wider network of anthropogenic sedimentary processes which generate a fascinating array of interconnected landscapes. Fluid topographies are restrained by bright orange silt fences; dredging barges continuously empty shipping channels which are promptly re-filled with sediment disturbed by upstream farms and new subdivisions; sensate geotextiles monitor the stability of landscapes they are literally embedded in; hulking geo-tubes lay engorged with dredged sediments in streams on Filipino golf courses and along Mexican beaches and on the coastal dunescape of Virginian spaceports. Silts, sands, and clays flow rapidly between these landscapes in liquid suspension, linking them and re-shaping the earth’s surface. Collectively, the choreography of these landscapes embodies a vastly quickened counterpart to conventionally defined geologic cycles — the Dredge Cycle. 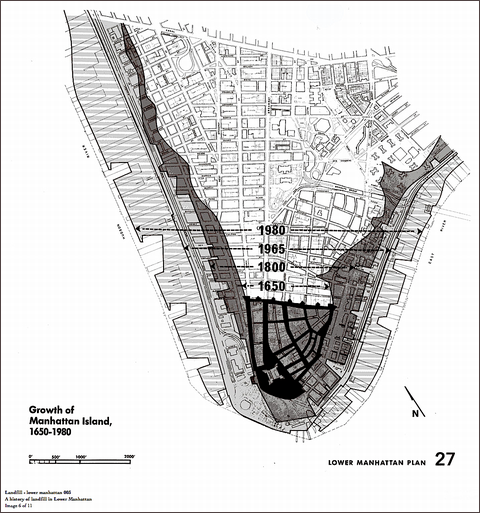 One site, still being planned, where the Dredge Cycle will make itself apparent—in the form of several billion dollars of real estate—is the Lo-Lo Ma project, which could connect Governor’s Island to the southern tip of Manhattan. Core77 explains how it will be done. In our study we found support for the general hypothesis: rTMS targeted at DLPFC changed spontaneous truth-telling/lying rate in a task with no mock-criminal, guilty knowledge, or personally relevant information processing contexts being involved. Importantly, clear hemispheric differences were found. In principle, artificial inhibition of the sustained neuronal activation-states in left DLPFC and possibly the concomitant effect on the systems intimately associated with DLPFC decreases the willingness to tell the truth (more non-truthful answers produced) and/or increases the willingness to tell lies. Conversely, inhibitory rTMS effect on right DLPFC and possibly the concomitant secondary effect on the DLPFC-associated systems increases willingness to tell truth (more truthful answers produced) and/or decreases willingness (or capability) to lie. The authors carefully note the limitations of their study. The effects of the magnetic stimulation may spread beyond the area adjacent to the coil; and so “ interpretations on causal effects of TMS exclusively through the TMS-targeted area should be taken with care”. The dorsolateral prefrontal cortex has many functions, and in a complicated task like “spontaneous” lying more than one may be activated: because “perceptual stimuli had to be named and two response variants chosen and reversed from time to time, the number of possible neural mechanisms that influence readiness to lie in our task and their possible interactions remain too numerous at present” to be sorted out. The spontaneity of the lying was limited to some unknown degree. Subjects were “instructed to name the colour correctly or just lie about it, naming the other colour that was not presented in this trial, being free to choose whether to lie or not”, but they were also told that only lying or only telling the truth would not be “good for the experiment”. The upshot is that there is a positive correlation between spontaneous truth-telling and rTMS stimulation of the right dorsolateral prefrontal cortex; and between spontaneous lying and stimulation of the left DLPFC. That’s very interesting. But it’s far from what you would gather from the headlines and stories online. The moral should be obvious. In matters of science, there is no substitute for reading the original studies. Science journalists, and for that matter popularizing philosophers, should be drawn upon cautiously. Moreover, the studies often present complexities and issues (as here) that summaries, especially of the ax-grinding sort, tend to omit. I learned this long ago when reading studies on animal perception that were cited over and over in the philosophical literature on representation. It was clear that only a few people had read the original studies; everyone else drew on their predecessors’ summaries. When I read the original studies, I discovered not only mistakes in the summaries but also a world of fascinating work that the “poor diet of examples” in the literature had simply omitted. 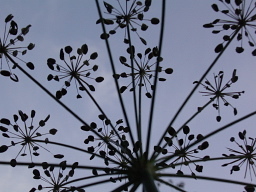 Insect senses in particular offered much food for thought, and I recommend it highly if you’re thinking about the origins of representation or defining sensory modalities. Philosophers have done a better job in the last twenty years. A much broader range of scientific results is brought to bear on philosophical debate, and prejudices according to which doing so is somehow unphilosophical have waned. Experimental Philosophy even generates its own results. But it’s well worth remembering, both when doing philosophy and when judging scientific results of political import, that although a great deal of expertise is required to contribute to ongoing research, rather less is needed to acquire a basic understanding of the results of research, to understand their limitations, and to evaluate second-hand accounts. —I’d have said you were dreaming. 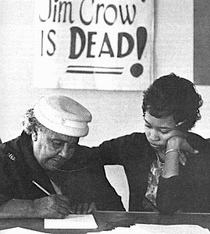 When I was growing up, Jim Crow’s death was a rumor. When I was growing up, blacks in the South went to “separate but equal” schools. White people rioted when the public schools were desegregated. 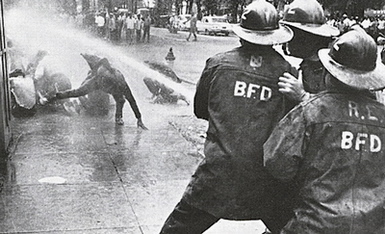 Civil rights demonstrators were greeted with dogs and high-pressure firehoses. 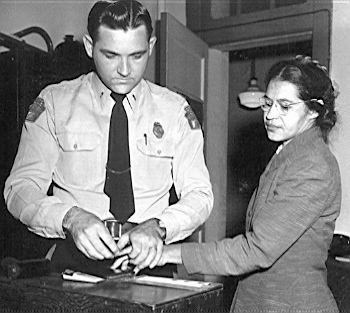 Rosa Parks was arrested for refusing to move to the back of the bus. Many people—some but not all of them “conservatives” in the spirit of the National Review fifty years ago—would just as soon that this history was relegated to museums. 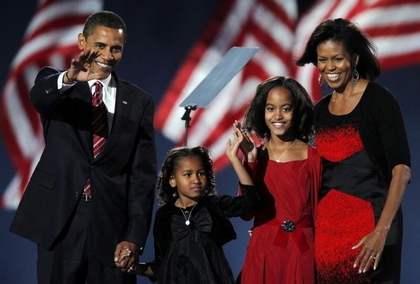 Obama’s election shows that now America is color-blind; the struggle is over. Maybe it is. And maybe the Southern Strategy will no longer work. But Obama’s accomplishment cannot be understood except by remembering the past—a past within living memory, a past in which merely voting, let alone holding office, was a right denied to millions on the basis of race. Obama’s victory is a victory for all those who kept their “eyes on the prize”. 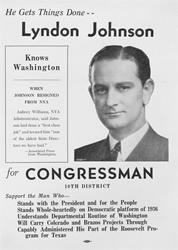 It’s been a hundred years since Lyndon Johnson was born in Stonewall, Texas. His presidency was shadowed by the Vietnam War. But his record of legislative accomplishment is comparable to that of Franklin Delano Roosevelt. In their twenty years in power since 1980, the Republicans have done their best to destroy the legacy of the Great Society (and, under Bush, they have also done their best to emulate the disaster of Vietnam). Even the Voting Rights Act, though it has not been repealed, has in recent years been gutted by a Justice Department more interested in Southern-style vote-suppression and race-baiting than in maintaining the franchise for those who were historically denied it. Looking at this, and remembering how strongly opposed I was to Johnson in ’68, I realize that those of us who were coming of age then could not imagine how good we had it. For a Johnsonian take on Johnson’s legacy, see the Lyndon B. Johnson Centennial Celebration. Very good reporting on the origins of the Hensley millions, which helped McCain start his political career. By now, many Americans know John McCain’s family story. His best-selling memoir, Faith of My Fathers, chronicles the lives of the senator’s father and grandfather, distinguished admirals. The book takes readers up through John McCain’s own military service, including his five and a half years as a prisoner of war in Vietnam. But Faith of My Fathers ends there, a few years short of John McCain’s marriage to Cindy Hensley and the advent of his political career. That’s only half the family story. The rest could be called “Cash of My Father-in-Law,” a tale of how beer baron James W. Hensley’s money and influence provided a complement to McCain’s charisma and compelling personal story and launched him to a seat in Congress — and perhaps to the White House. Taking advantage of restrictions on liquor by violating them to make money is a common racket. Joseph Kennedy, father of Jack, is supposed to have made money from illegal imports of liquor from Canada during Prohibition. Our no-longer-local beer company, Anheuser-Busch, though it didn’t score during Prohibition, did very well immediately after. Among the first public appearances of famous Clydesdales was a delivery of fresh cases of Budweiser to the White House in April 1933. Added 26 Aug: more of the same from the Times: David M. Halbfinger, “For McCains, a public path but private wealth” New York Times 22 Aug 2008. The numbers indicate by how many standard deviations a program exceeds the mean. Source: Chronicle of Higher Education. Left column: 2007. Right column: 2006. The measure is based on statistics concerning publications, grants, awards and honors, and so forth. These are normalized and weighted to yield the composite scores you see above. It should be clear that although the scores are significant, the rankings aren’t. They’re too volatile. Only three departments manage to remain in the top ten from 2006 to 2007. It’s true that in sports the standings from one year to the next can vary just as much. They, however, are based on the unimpeachable won-lost record. 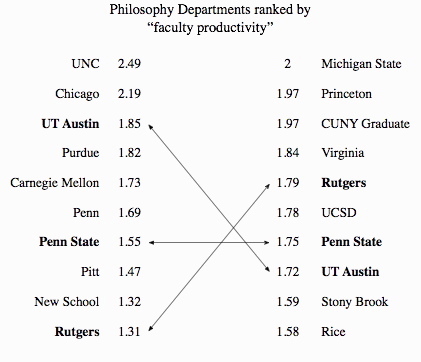 A perusal of the puffery for the “Faculty Scholarly Productivity Index™ (FSP Index)” shows that arbitrariness enters into the formulation of the Index not only in the weighting of its various components but also in the methods used to calculate those components. One book is given the weight of five articles, and so on. Institutions can buy the raw data. But I wonder how many administrators, pressed for funds, will do so, and spend more money to have the data analyzed again. Yet that’s what you’d need to do to know how robust a measure the FSP is. Unfortunately, the numbers will be used to make distinctions they cannot rightly be said to justify. Academic Analytics claims that “more universities than ever are using FSP on their campus”, and I believe them. What I don’t believe is that the FSP is as objective as they claim. Carnegie-Mellon, which ought to know better, highlights its no. 5 ranking in 2007; but a year earlier, as you can see, they weren’t even in the top ten. Michigan State’s index plunged from 2 to below 1.31 in one year. Were they exhausted after their stellar season? 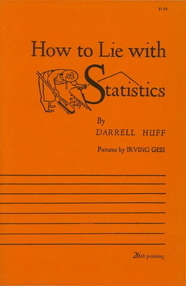 Relying on statistics is not more accurate when the statistics are improperly used. Indeed, statistics can mislead when they are misapplied or misunderstood. Much of modern bibliometrics seems to rely on experience and intuition about the interpretation and validity of citation statistics. While numbers appear to be "objective", their objectivity can be illusory. The meaning of a citation can be even more subjective than peer review. Because this subjectivity is less obvious for citations, those who use citation data are less likely to understand their limitations. The sole reliance on citation data provides at best an incomplete and often shallow understanding of research—an understanding that is valid only when reinforced by other judgments. Numbers are not inherently superior to sound judgments. The last item, I think, may be irrelevant to the people who are most likely to be customers of Academic Analytics. I have in mind administrators or the people who hire them, people who think that a university should be run like a business. The point of appealing to the FSP and measures like it is to avoid judgment, substituting for it the authority of numbers. “A ‘Nixon going to China’ moment”Geomblog, 14 June 2008. Abraham Mahshie. “Former executive spooks some, but not all, faculty” Columbia Daily Tribune, (21 Dec 2007) p. 1A. Also here ( ).